MyPhone Rio LTE is now officially released and is currently the value-for-money king. The local smartphone outfit boasts that the device is one of the must-try handsets in the country. With the rock-bottom price of Php 6,499, you’ll get every sought-after specification that you’ll need for your daily driver. So what does the 4.5-inch LTE phone has to offer in the table? Check out, right after the fold, our top 5 reasons for you to buy this piece of worker. Living up to its name, the MyPhone Rio LTE offers fast internet of 4G speeds. Last month we have reviewed the Cherry Mobile’s own LTE offering, the Ultra, and we did get good results. The Rio LTE however is running with a MediaTek chip, so I think we need to get a good grip of the unit to test its speed. But on paper, having LTE connectivity will give you faster media downloads and uploads, speedier video streaming and browsing. As of this writing, KitKat is the latest end-consumer version of the Android mobile operating system. KitKat changelog is characterized with unlimited home screen panels for your apps and widgets, and the “OK Google” voice command to prompt Google Now. The MyPhone Rio LTE sports a MediaTek MT6582M quad-core processor that is clocked in a 1.3-gigahertz speed. Aside from the processor, the device will also be powered by 1GB of RAM. You’ll have the basic 4-gigabyte built-in storage. However, the Rio LTE supports memory expansion through a microSD slot – fit for active downloaders and multimedia monsters. 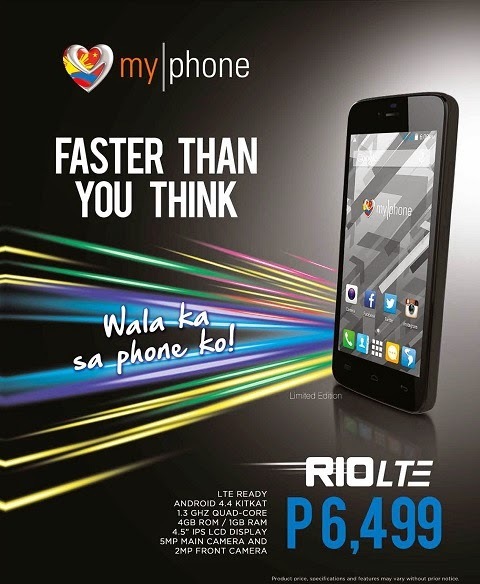 As I have mentioned earlier, the MyPhone Rio LTE is only priced at Php 6,499. This makes it as one of the most affordable LTE offerings around. You also get a 5-megapixel rear camera and a 2-megapixel “selfie” shooter on the front. The capable 1,700 mAh battery is also up to feed your hardware.